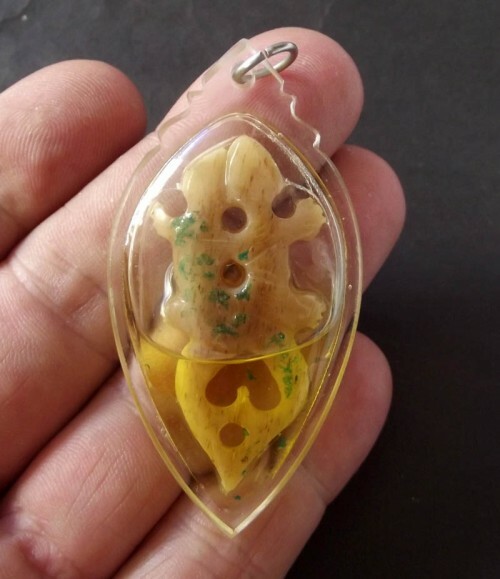 Hand Carved Twin Gecko Love, Anti Black Magic, and Business Charm, immersed in Metta Oil. Made for the Wai Kroo 2555 BE Edition of Amulets by Luang Por Chor of Wat Hnong Saeng. The Geckos are almost Inextricably Entwined in a Loving Symbiotic Embrace, and have recieved individual Invocations of Prai Gecko, 4 Elements and 32 Components of Living Beings Incantations. Inscription of Ancient Khom Spells on the surface of the Geckos was given by Luang Por Chor before they were immersed for 3 months, and then encased before final Puttapisek Empowerment Ceremony on Wai Kroo Day. 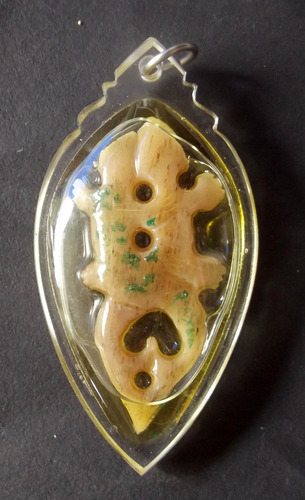 Apart from these Gecko Charms, a large series of other amulets and charms was released in the Wai Kroo ’55 Edition; Pae Maha Lap (hand carved lucky goat), Dork Mandarapa (carved wooden love flower – also made in sacred metals), Khun Phaen Klueab Hlang Sariga (Khun Phaen ceramic glaze powder amulet with hand painted Sariga Birds – 3 types were made in the series), Sariga Koo Chiwit (powder amulets with hand painted Sariga Birds – released in three versions, two with Ganesh on the back and one with LP Chor Image on back face), Taep Paya Nak Giaw hlang Pikanes (powder amulet special edition with 2 entwined Nagas, and Ganesha image on rear face), Takrut Taep Sariga (Sariga Takrut), See Pheung Sariga Lin Tong (golden tongue Sariga Bird Balm Potion), Pra Pid Ta Ngern Larn (sacred powder black lacquered Pid Ta amulet), Pra Rahu Gala Ta Diaw Liam nam Man (Rahu carved one eyed coconut amulet immersed in Metta Oil), Palad Choo Chok (Jujaka Lucky beggar /Palad Khik in sacred metals). The Gecko has always been a Magical creature for Thai People that has natural Anti Black Magic properties, and that has great Metta Mahaniyom power to increase success in Business and Social Environments. The Jing Jok is a very popular amulet in Thailand with both Male and female devotees, probably not only due to its great power to attract wealth and admirers, lovers and money, and protect from Black Magic and Evil Spirits, but most probably also because of the easiness of use, which makes the Jing Jok a powerful Magical tool which needs little extra work to coax into performing its duty. 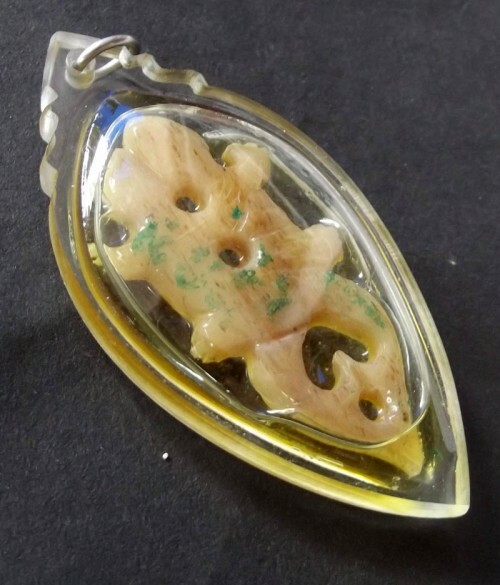 Most Gecko Charms are pure Maha Sanaeh, and Metta Mahaniyom, but there are also pro-active Gecko amulets as well as those intended for more protective purposes, depending on the construction and empowerment of the spell. All Gecko amulets however, possess the ability to ward off Black Magic and Sorcery. 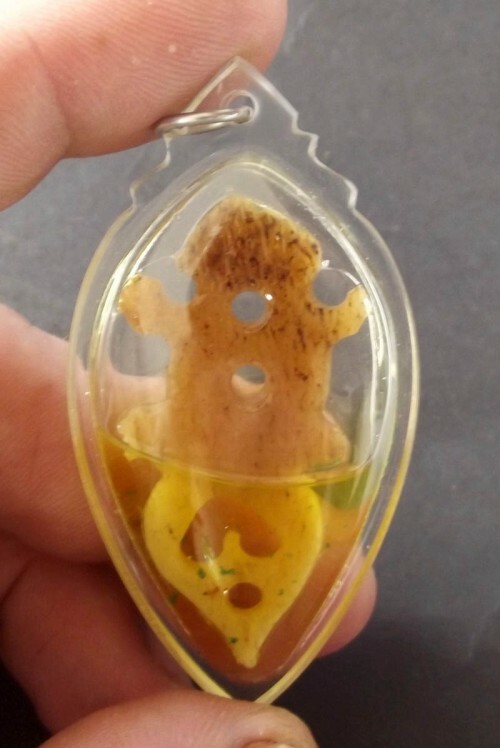 This amulet was released in the Wai Kroo 2555 Edition of Amulets by Luang Por Chor in a Major Blessing Ceremony at Wat Nong Saeng.